Donegal County Archives has received four historic documents relating to the opening of the new school building for Irish college Coláiste Uladh, Gortahork, on 21st July 1968, exactly fifty years ago this month. 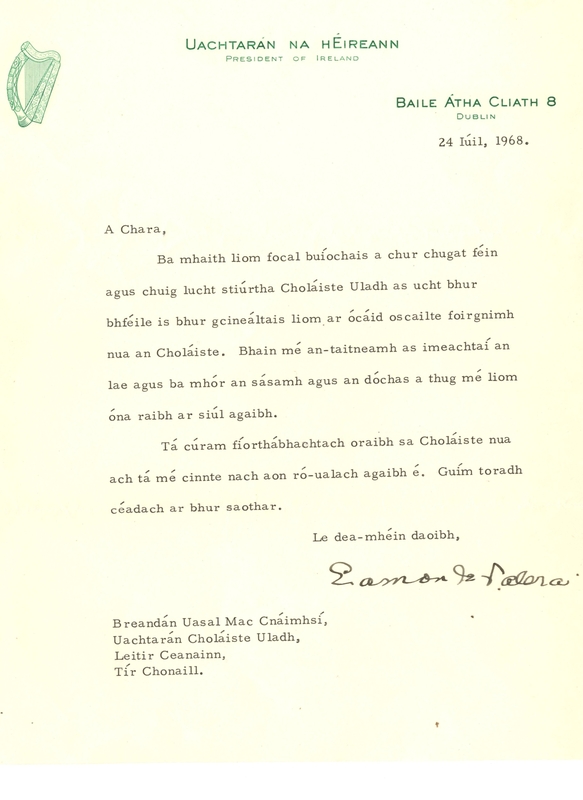 Also included is an original invitation card, personally signed by President de Valera, to Bean Bhreandán Mhic Cnaimhsí, with details of the day’s programme, including Mass and Blessing by the Bishop of Raphoe, An Dr. Mac Ficheallaigh and the Official opening by the Minister for the Gaeltacht, Pádraig Ó Fachtna. All the documents are originals and signed by President De Valera. The collection was kindly donated by the family of Breandán Uasal Mac Cnáimhsí and Donegal County Archives was delighted to be its recipient. The documents have been scanned and listed, added to the County Archives database and are available to view online and by prior appointment at the Archives research room in Lifford.